A home to over 100 thousand artworks, the Tretyakov Gallery has the world’s largest collection of Russian art. To explore the massive exhibition properly, you’d have to wander through the maze of the gallery halls for days. To speed things up we have put together a list of the 10 most iconic artworks and where to find them. On a sunny day in August 1887, 11 year old Vera, the daughter of entrepreneur and philanthropist Savva Mamontov, rushed into the house, grabbed a peach and sat down for a quick bite. Painter Valentin Serov, a frequent visitor to the house, was so impressed by her joyous look, that he immediately asked the girl to sit for him. To this day ‘Girl with Peaches’ is the artist’s most famous work and one of Russia’s most popular internet memes. You’ll find it in hall number 41. One of the most recognizable icons in the western world, Holy Trinity is a famous work by enigmatic Russian iconographer, Andrei Rublev. In the delicately allusive picture there are three angels seated under Abraham’s tree, this is how Rulbev chose to depict the nature of God, so in fact what we see is the Father, the Son, and the Holy Spirit. You can admire this masterpiece along with many other ancient icons in hall 60. Russian artist Mikhail Vrubel is known for the peculiar magnetism of his works and the famous ‘Demon’ is no exception. An illustration to the eponymous poem by Mikhail Lermontov, the image has a certain tactility to it and almost sculptural definition. The powerful but strangely melancholic demon, whom the artist himself described as “majestic and power-hungry” is watching the world transform before his eyes, which symbolizes the eternal struggle of tormented spirit. Beautifully designed halls number 32-33 are devoted to works by Mikhail Vrubel. A haunting picture with a message “to all great conquerors, past, present and future”, the Apotheosis of War could have been named “The Triumph of Tamerlane”. The pyramid of skulls in the middle of a wasteland is what the 14-15 century conqueror Tamerlane usually left after himself. The artist decided that the picture conveys a much deeper meaning. Go to hall 27, if you want to see it with your own eyes. The second most popular painting in Russia, ‘Morning in a Pine Forest’ was co-created by Ivan Shishkin and Konstantin Savitsky, the latter added the bear family. The philanthropist and art-collector Pavel Tretyakov chose to credit the panting solely to Shishkin, explaining that “from the idea to performance, everything speaks of the painting manner and creative method peculiar to Shishkin only”. It is believed that forest in the picture is the one the painter saw on Gorodomlya Island, located on Lake Seliger in Tver Oblast. A favorite picture of the famous Russian writer Dostoevsky, ‘the Rainbow’, for the first time in history of Russian art, takes the viewer into the very eye of storm. Raging sea, shimmering glimpses of rainbows and unexpectedly warm color tones give the painting that whimsical mix of horror and hope that probably enchanted the author of Crime and Punishment. To see Dostoyevsky’s favorite picture, go to hall 19. Painted by one of Russia’s most influential 19th century landscape painters, ‘the Rooks have Returned’ is a fine example of the lyrical landscape style. Savrasov’s most renowned painting, it manifests the artist’s love for the rural Russia. The painting can be found in hall 18. This emotional painting was inspired by the story of an impostor, who called herself Elizabeth Tarakanova, who claimed to be a daughter of the Empress Elizabeth Petrovna. Catherine II ordered her lover Count Orlov to seduce Tarakanova and bring her from Italy to Saint Petersburg, where the princess was imprisoned in the Peter and Paul Fortress and eventually died either from tuberculosis or during the flood in 1777. Look for Princess Tarakanova in hall 16. A revolutionary painting which brought the artist the title of professor, ‘the Unequal Marriage’ derived from Pukirev’s own unfortunate personal experience. A girl he was madly in love with was married off to a wealthy much older man, so the young man behind the bride in the picture is believed to be the artist himself. The contemporary topic and important questions the painting was raising brought an astounding public success and recognition from the Imperial Academy of Arts in St Petersburg. The painting is located in hall 16. One of the greatest pieces of Russian 19th century art, this masterpiece took the artist 20 years to finish. Ivanov took the theme he considered “universal” from John (1: 29–31). 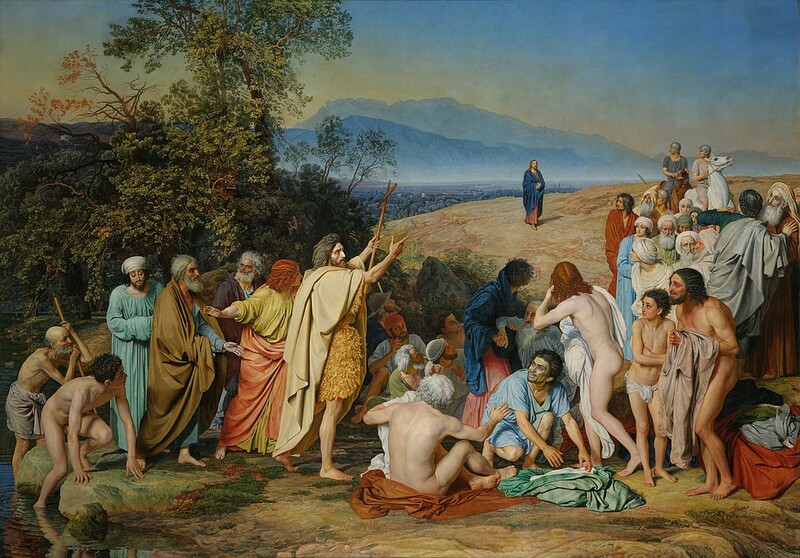 The painting alludes to a number of Biblical stories and centers on the figure of John the Baptist. The figure close to Christ has the face of N.V. Gogol, the famous writer, while the wanderer sitting close to John is Ivanov’s self-portrait. The seven meter long painting is the centerpiece of hall 10.